Are you looking for a creative way to display your stock of many candles? Or just want a fresh idea for your seasonal centerpiece? 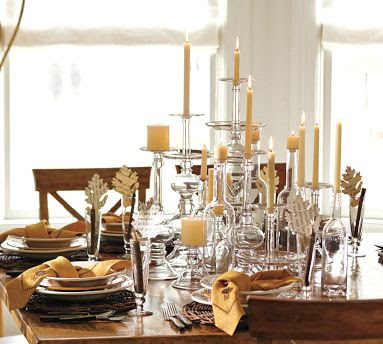 Head over to Pottery Barn.. lots of ideas over there. 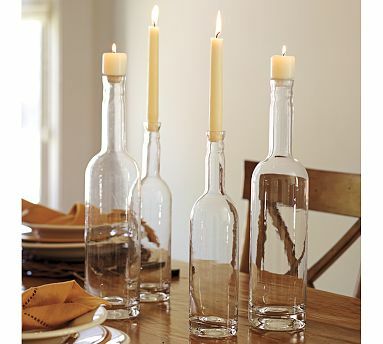 Check out this Eclectic Glass Bottle Set it's on sale. Oh, so you don't want to spend on empty bottles? Well get your DIY on! I'm sure you have some wine bottles laying around.. Hmm? After you enjoy the wine ( or whatever was inside the bottles) strip the labels, wash it up and Wha-La! You can drop some cranberries, leaves, corn kernels, or what ever you can find seasonal in the bottle. It'll add a bit of extra Flair to the display.